TOKYO -- Hong Kong Express, the Chinese special administrative region's first and only low-cost carrier, is stirring up the Asian travel market. Launched in October, the company in November established routes linking Hong Kong with Tokyo's Haneda Airport and Kansai Airport near Osaka. New day trip options, aimed at business travelers, allow for quick jaunts at a relatively low cost. Hong Kong Express has a flight leaving from Haneda at 1:30 a.m. and arriving in Hong Kong at 5:45 a.m. The return leg departs at 7:05 p.m. the same day, touching down in Tokyo at half past midnight. While the exact fares vary by season, a round-trip ticket goes for around 30,000 yen ($287). That is roughly on a par with a trip from Tokyo to Osaka and back. Upon early-morning arrival in Hong Kong, travelers have the option of paying 400 Hong Kong dollars ($51) to spend two hours in an airport lounge, where they can have breakfast, take a shower and freshen up before meetings. The evening flight leaves late enough to let businesspeople stay in the city until around 5 p.m., completing a full work day. Flying only the Airbus A320 with a pool of experienced pilots trained for that specific jet helps Hong Kong Express keep costs -- and therefore fares -- down. The company undercuts Japanese budget carrier Peach Aviation. 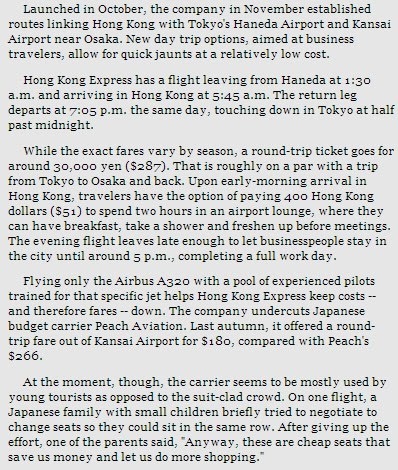 Last autumn, it offered a round-trip fare out of Kansai Airport for $180, compared with Peach's $266. At the moment, though, the carrier seems to be mostly used by young tourists as opposed to the suit-clad crowd. On one flight, a Japanese family with small children briefly tried to negotiate to change seats so they could sit in the same row. After giving up the effort, one of the parents said, "Anyway, these are cheap seats that save us money and let us do more shopping." 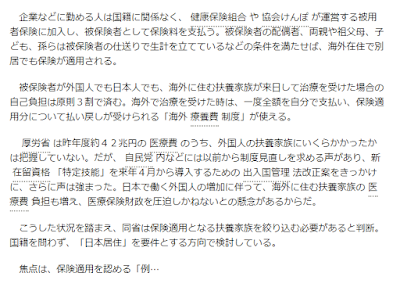 Two Chinese men in their 20s were on their first sightseeing trip to Tokyo. The plane would arrive before Tokyo's public transportation gets going in the morning, but they were not worried. "It's all right," one said, "we have friends picking us up." Still, there are clearly possibilities here. Many Japanese companies have subsidiaries and affiliates in Hong Kong, using them as bases for doing business in China and the rest of Asia. 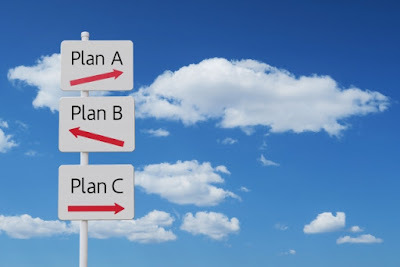 For smaller companies, overseas business trips are costly not just in terms of cash but also because key people have to leave their desks for extended periods. 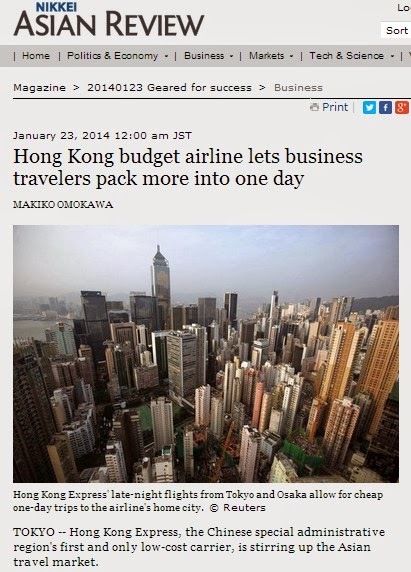 Cheap day trips with low-cost carriers like Hong Kong Express could make business travel more feasible. 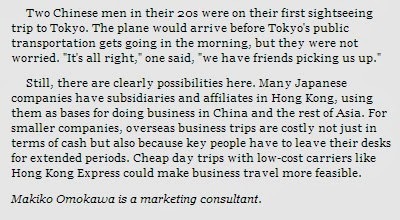 Makiko Omokawa is a marketing consultant.